In 1964, the conversion of a standard UH-1D to a twin-engined configuration was funded by Bell. Work was done in Fort Worth, and by the spring of 1965, the prototype Model 208 Twin Delta was ready to fly. Its powerplant comprised two Continental T72-T-2 Model 217 turbo-shafts mounted side by side and driving, via a combining gearbox, a single output shaft. Designated XT67-T-1, this powerplant offered 1,240shp for take-off. The maiden flight was made on 29 April, 1965. On 1 May 1968 the Bell Helicopter Company announced that following negotiations with the Canadian government and Pratt & Whitney Aircraft of Canada, it had been agreed to proceed with the development of a new helicopter based upon the airframe of the Bell Model 205/ UH-1H Iroquois, of which the first of 10 for the Canadian Armed Forces (CAF) had been delivered on 6 March 1968 under the designation CUH-1H. Power-plant of the UH/CUH-1 consisted of a 1044kW Avco Lycoming T53-L-13 turboshaft engine. The CAF considered that the incorporation of twin turboshaft engines would provide a number of benefits, and this led to development of the initial military Bell Model 212 and the Pratt & Whitney Aircraft of Canada (PWAC) PT6T power-plant for it. This programme was initiated as a joint venture, financed by Bell, the Canadian government and PWAC. The PT6T Twin-Pac designed and developed by PWAC, consisted of two turboshaft engines mounted side-by-side and driving, via a combining gearbox, a single output shaft. This had an output in its initial production form of 4.66kW/kg, compared with 4.19kW/kg for the already-developed Lycoming T53 turboshaft. As installed in the Model 212 the PT6T-3 is limited to an output of 962kW for takeoff. In the event of a failure of one of the two turbines, sensing torquemeters in the combining gearbox signal the remaining turbine to develop a power output ranging from 764kW to 596kW, for emergency and continuous operation respectively. Initial deliveries of military Model 212s were made to the USAF in 1970. This variant, known as Model 212, was to have a two-blade all-metal semi-rigid rotor, and accommodate a pilot and up to fourteen passengers and, in its military variant, armament could include 7.62mm MAG pod machine-gun systems, 70mm air-to-ground rocket launchers (7 or 19 rounds), side-mounted 12.7mm or 7.62mm machine-guns. The airframe is generally similar to that of the UH-1H Iroquois, with an all-metal fuselage structure, and skid landing gear. A 14-passenger commercial version known as the Twin Two-Twelve was developed more or less simultaneously, this differing from the military model primarily in its cabin furnishing and avionics equipment. The Twin Two-Twelve gained FAA Transport Type Category A certification on 30 June 1971, and the type has since gained certification for IFR operation, requiring a new avionics package, new instrument panel, and stabilisation controls for such use. On 30 June 1977 it became the first helicopter to be certificated by the FAA for single-pilot IFR operation with fixed floats. In June 1980, an improved variant of the PT6T-3, the PT6T-3B, was introduced which besides giving more power (1,800shp), also offered improved single-engine performance. In mid-1988, producton of the Model 212 was transferred to Bell's Canadian factory. The order for a first batch of fifty helicopters was placed by the Canadian Armed Forces (under designation CUH-1N, later modified to CH-135) and the first Model 212 flew in April 1969. More orders soon followed, both civil and military: seventy-nine UH-1Ns for the US Air Force; forty UH-1Ns for the US Navy and twenty-two UH-1Ns for the US Marine Corps; 159 more being ordered later by the US Navy and Marine Corps. The enhanced safety offered by the Twin-Pac powerplant has resulted in many sales to operators who provide support to offshore gas/oil prospecting and production companies, as well as to air taxi organisations. 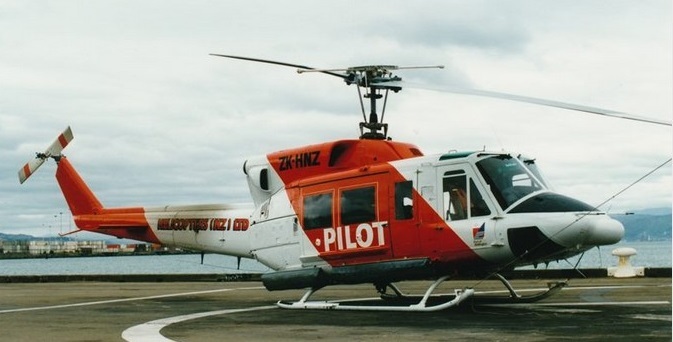 Eight Model 212s were delivered to the Civil Air Authority of China during 1979, and were the first helicopters supplied to the People's Republic of China by a US manufacturer. The 212 features an all-metal two-blade semi-rigid teetering main rotor with interchangeable blades; underslung feathering axis head; rotor brake optional. Fully powered hydraulic controls; gyroscopic stabiliser bar above main rotor; automatic variable incidence tailplane; IFR versions have large fin above cabin to improve roll-yaw responses during manual instrument flying. The metal main rotor blades have extruded aluminium nose sections and laminates; glass fibre safety straps provide redundant load path; fuselage conventional light metal. Tubular skid type. Lock-on ground handling wheels, high skid gear, fixed floats and emergency pop-out nylon float bags optional. Pratt & Whitney Canada PT6T-3B Turbo Twin-Pac, comprising two PT6 turboshafts coupled to combining gearbox with single output shaft. Engine rating 1,342kW for T-O, 1,193kW maximum continuous; OEI rating 764kW for 2.5 minutes, 723kW for 30 minutes. Transmission rating 962kW for T-O, 846kW maximum continuous and 764kW OEI. Five interconnected rubber fuel cells, total usable capacity 818 litres. Two 76 or 341 litre auxiliary fuel tanks optional, to provide maximum possible capacity of 1,499 litres. Single-point refuelling on starboard side of cabin. Oil capacity 11.5 litres for engines, 8.5 litres for transmission. Pilot and up to 14 passengers. Dual controls optional. In cargo configuration, has total internal volume of 7.02 cu.m, including baggage space in tailboom, capacity 181kg. Forward-opening crew door each side of fuselage. Two doors each side of cabin; forward (jettisonable) door hinged to open forward, rear door sliding aft. Accommodation heated and ventilated. The 212 has been manufactured under license in Italy by Agusta as the Agusta-Bell AB.212, who built a demonstration prototype in 1971, initially in a civil configuration for VIP transport, but later transformed into a military configuration (corresponding to the UH-1N). These are generally similar to the American-built aircraft, but Agusta has developed an ASW version designated AB.212ASW. Structural strengthening took place, plus the provision of deck restraint gear, and the PWAC PT6T-6 Twin-Pac turboshaft rated at 1398 kW for take-off. This version has been exported to Greece, Turkey, Peru, and Spain. Distinctive features of the AB-212 antisubmarine helicopter include a special anticorrosive treatment for the powerplant, a search radar housed in a dome on the cabin roof, special electronics, sonar, antisubmarine and antiship armament, consisting either of two Mk.44 antisubmarine torpedoes, two AS-12 missiles, or two antiship missiles, depth charges and flares. The crew consists of two pilots and two operators. The Italian Air Force became interested in the Agusta AB-212 and acquired a few for air base rescue services. Inside an 18-place Super Transport are wide and comfortable seats with adequate hip room and shoulder room. The cabin design provides superb passenger visibility. The 212 has also been fitted with a four-blade rotor with redesigned blades. This variant, designated Model 412, has been in production in the USA and Italy since 1981. The four-blade rotor can also be fitted to the old 212s. The US Marine Corps flies the VH-1N as a dedicated VIP transport. The US Navy unit VXE-6 operates about six bright-red UH-1Ns in the Antarctic. In 1972, a UH-1N dropped a parachutist over McMurdo Sound, Antarctica for a record jump of 6247m. 100 UH-1N were to be rebuilt and upgraded to the UH-1Y configuration. Canadian version, originally CUH-1N. Total 50 delivered 1971/72. US Air Force, Navy and Marines version. Total 320 delivered. Civil version; first flight 16 April 1969; FAA certification 30 October 1970; FAA Category A transport certification 30 June 1971; IFR certification granted by FAA, UK CAA, Norwegian DCA and Canadian DoT; first-ever single-pilot IFR certification with fixed floats granted June 1977. Agusta-built version for anti-submarine warfare. Engine: 2 x P&W PT6T-3B coupled, 900 shp. Max ramp weight: 11,200 lbs. Max useful load: 5057 lbs. Max landing weight: 11,200 lbs. Max sling load: 5000 lbs. Max usable fuel: 1455 lbs. Max rate of climb: 1420 fpm. Hover in ground effect: 11,000 ft.
Normal cruise @ 3000 ft: 100 kts. Endurance @ normal cruise: 2 hr. Engine: 1 x P&WC PT6T-3B Twin Pac. Max range (no reserve): 512 km. Engine: 1 x 1,875-shp (1398-kW) Pratt & Whitney Canada T400 (PT6T-6) Turbo Twin Pac with two gas-turbine power sections. Rotor dia: 14.63 m (48 ft 0 in). Rotor disc area 173 9 sq.m (1,872.0 sq ft). Height 4.53 m (14 ft 10¼ in). Empty wt: 3420 kg (7,540 lb). MTOW: 5070 kg (11,176 lb). Max range with auxiliary tanks (no reserve) 667 km (414 miles). Armament: two Mk 46 AS torpedoes or two depth charges or two anti-ship missiles.